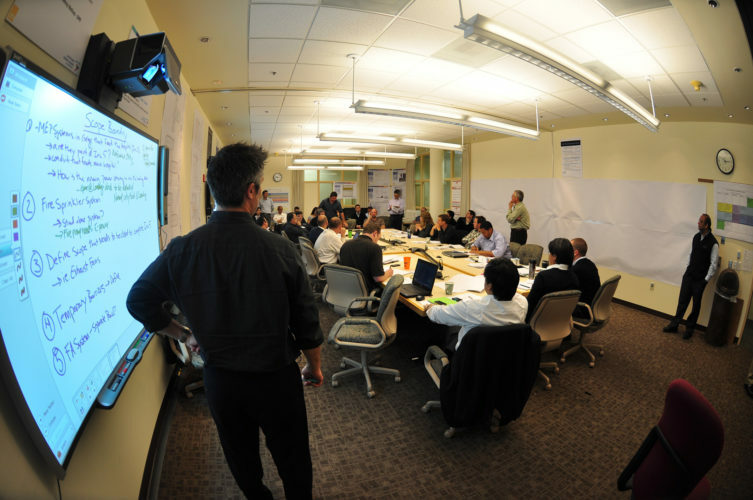 The last decade has seen a push towards lean construction techniques and integrated project delivery, including extensive use of building information modeling (BIM) and collaboration software, along with new organizational approaches such as the “Big Room.” The Big Room is an on-site co-location space that physically brings together designers, builders, and often facility operators to work together. The Big Room has several different objectives and provides many benefits, both directly and indirectly. First and foremost, it aims to improve collaboration through greater team integration. Early integration enables a team to deliver a higher performing building, on time and on budget. Through the intense interdisciplinary collaboration that happens, teams are able to design a building with systems that complement and support each other and the goals of the project. Co-location also makes it easier to ask team members for the latest information, reducing the time wasted looking for up-to-date information, or working with outdated information. As construction projects have grown increasingly complex, especially in highly technical facilities such as hospitals and data centers, the industry has necessarily responded with more and more specialization. This in turn has led to the vast array of subcontractors and consultants that contribute to projects today, including key trades such as mechanical, electrical, and plumbing, along with auxiliary trades such as glass and glazing, elevators, pneumatic tubes, medical gas, landscaping, and so forth. The coordination of 20 to 30 individual firms on a single project can and does quickly become highly complicated. Simply getting a question answered by a different specialty can take days or weeks, and many teams do not realize that the time it takes for requests for information (RFIs) to be answered often becomes a driving force behind the length of their production schedule. By bringing key project stakeholders together in one place, team members are able to literally turn to one another to get answers, rather than waiting for RFIs to be answered in another city or time zone. In the Big Room, knowledge sharing is further enhanced by 3D and 4D visualizations. 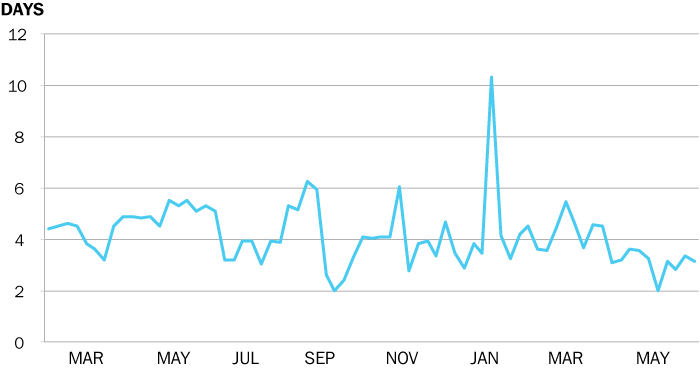 Average RFI turnaround on a major hospital project using a Big Room. The integrated environment also helps reinforce a project identity separate from the cultures of team members’ respective firms. Through co-location and the breakdown of individual company “silos,” team members develop a better understanding of shared project goals and start making decisions for the good of the project, not simply for the short-term benefits of individual organizations. It is easy to become enthusiastic about the potential benefits of co-location and co-creation, especially as owners and teams begin to see the positive outcomes of working side-by-side, such as compressed schedules (through fewer RFIs) and decreased rework (through collaborative design practices). It is more difficult to determine which trades and subcontractors should be integrated into the process during different phases of the project. To make the Integrated Big Room more efficient, we must first understand who is interacting with whom, about what, and when. Once we reveal the nature of the interactions, we will be able to focus on the quality of those interactions to achieve better, more predictable project outcomes. Typical pull planning session in the conference room of one Big Room. Having the entire team co-located makes inter-disciplinary collaboration easy and effective. Inside the Big Room at UCSF Mission Bay. The flow of information within a team can reveal where information interdependencies lie, and therefore who must collaborate most often with whom. Because teams use file sharing software and computer models extensively, there is a wealth of electronic data than can be used to reveal information workflows. For example, if the structural engineer and the electrical subcontractor very frequently view files created by one another, they clearly each have knowledge that the other needs, and should both be located in the Integrated Big Room at the same time to make that collaboration more efficient. Conversely, the foodservice or landscape designers may collaborate infrequently with other trades, and therefore it may not be cost-effective to co-locate them. Building on a decade-long collaboration with Stanford University’s Center for Integrated Facilities Engineering (CIFE), DPR asked Martin Fischer, the director of CIFE, and Reid Senescu, a postdoctoral research fellow in Stanford’s Center for Design Research, to perform an in-depth analysis of information workflows on a large-scale hospital project. The project team uses Bentley ProjectWise as an information management system, and Senescu analyzed the data from almost 30,000 files to measure and visualize the complex workflows between team members. Of partcipants said the Big Room helped the project. Said we can make the Big Room more efficient. Survey of 53 Big Room participants on one hospital project. Senescu looked at ProjectWise logs of team members creating, editing, and viewing files. He then applied the automatic information dependency algorithm to determine the relationships between information. For example, a structural engineer might have used weight information from an equipment list spreadsheet to create a structural analysis file. After running the algorithm on the ProjectWise logs, Senescu developed a “team information interaction sequence” (TIIS) to see how disciplines interacted with other disciplines. Senescu likens the TIIS to a “fingerprint of collaboration” for the project. And, because every project is unique, “each project will have a different TIIS fingerprint.” Senescu created a TIIS for every month of the project, so he could analyze the change in information flows over time. This may make it possible to determine who should be the “lead” discipline in the Big Room at what time; earlier in the project, the architect may be more crucial, while later the general contractor may fill that role. Senescu visualized the TIIS in the figure. 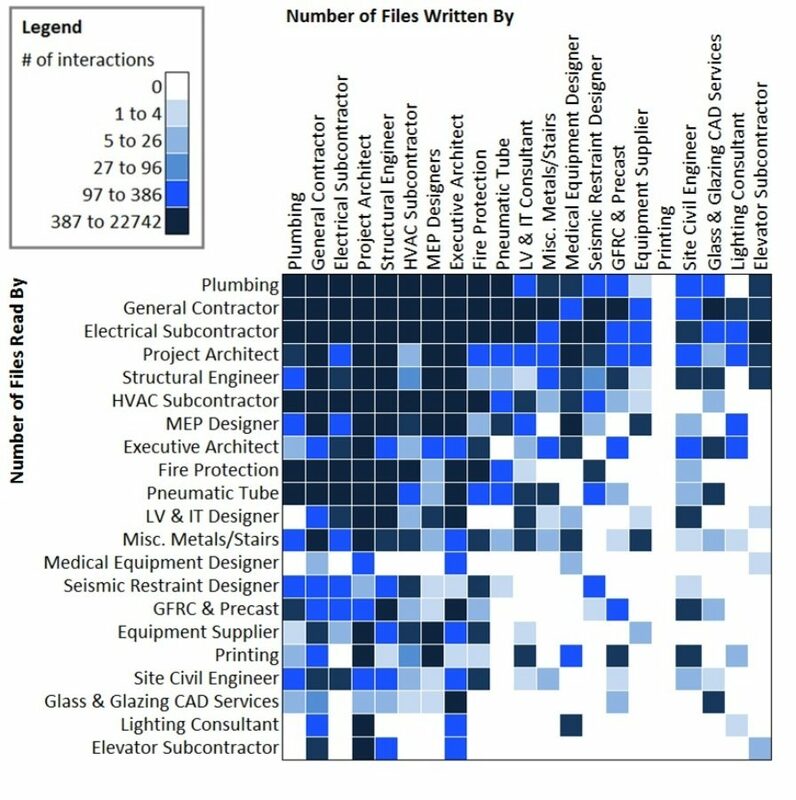 The chart displays the interaction between number of files written, and number of files read by each discipline. The darker the square, the more interactions occurred between the disciplines. Senescu is currently analyzing information workflows for 25 DPR projects. Though new to the construction industry, using algorithms to look at relationships between individuals is common in fields such as sociology and epidemiology. Specifically, sociologists use algorithms to study connections of online social networks, and epidemiologists use algorithms to predict how diseases may spread throughout populations. One common metric is “betweenness centrality,” or the extent to which one individual lies between others; passing disease, friendship, or in this case, information, from and to other individuals. For example, early in the hospital project, the architect’s betweenness centrality spiked, suggesting that almost all information was passing through the architect. Clearly, the architect was the most central player on the team at that time, and not only should have been co-located, but also should have been the lead discipline. When the general contractor has the highest betweenness centrality, it should lead Big Room meetings. By identifying where the most frequent information exchanges occur at various times throughout a project, a team can understand who is absolutely necessary to have in the Integrated Big Room and other collaboration periods (such as integrated concurrent engineering (ICE) sessions). This allows the team to become more effective, and more efficient in its use of time and resources. Understanding common workflows might also help to identify communication breakdowns before they occur, according to Sensecu. Imagine a situation in which there are two weeks before scheduled duct prefabrication, but the mechanical subcontractor has not yet viewed the latest column layouts. In other words, the mechanical sub had not been collaborating effectively. An intelligent application could alert the project manager that previous projects with this type of communication breakdown have resulted in poor performance outcomes. This type of workflow prediction would clearly have powerful impacts on project team performance. Though not yet available, Senescu is currently working on bringing this type of software to the industry. VIDEO: The interaction of various project disciplines over time. Ultimately, understanding information workflows provides two types of opportunities. First, by making workflows transparent to all team members, it increases the entire team’s ability to collaborate efficiently, effectively, and with agility. That means less rework, and better-integrated designs which result in a higher performance facility. Secondly, correlating information workflow patterns (represented by the TIIS) with project performance informs project managers and helps them make the overall process more efficient. It’s too resource-intensive to have everyone in the Big Room at all times, but collaboration periods are also ineffective if all the necessary people are not present. The TIIS helps managers decide when particular disciplines should be present, and who should be leading the conversation. It also helps alert managers to potential breakdowns based on workflows of past projects, so teams do not repeat the same mistakes. Since the first CAD files, project teams have organized their digital information as if it is merely paper documents in a file cabinet. But, so much of a project’s organization and process can be deduced and represented from digital interactions, an unprecedented opportunity exists to make information work- flows transparent. This transparency enables agile collaboration and management that is informed by past project outcomes. This agility will result in more integrated, more efficient projects, ultimately providing more value to all stakeholders. Right technology: Build a technology infrastructure to support needs (i.e., Smartboards, collaboration platform such as Projectwise, etc.). Organize by clusters: Arrange people not by company but by production team or clusters (i.e., MEP team for particular scope sits together). Well-planned meetings: Develop detailed agendas that include topic, time, primary facilitator and required attendees for all hands meetings. Not everyone has to sit through every part of every meeting. Use models as much as possible during meetings. Time to work: Schedule time for production work…a no meeting time! ICE, ICE, ICE! : Encourage integrated concurrent engineering (ICE) sessions and plan them. 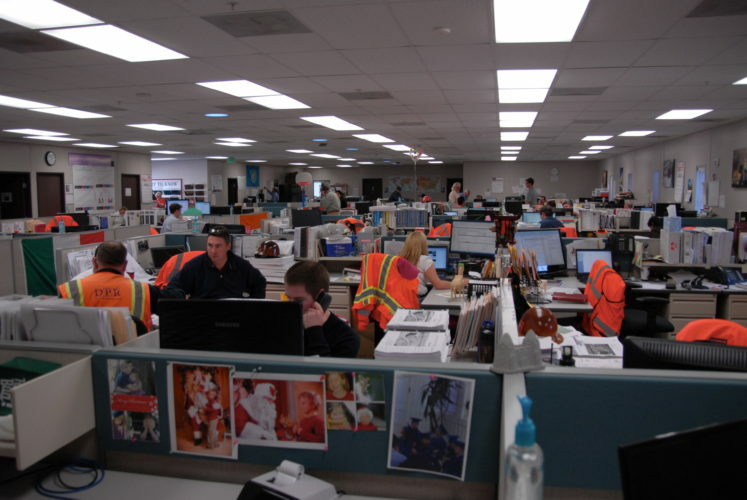 Daily huddle: Gather every day to address any latency issues and adjust teams accordingly. Respect time: Recognize team members who have a smaller role and align meetings to take advantage of their expertise when they are in the big room. 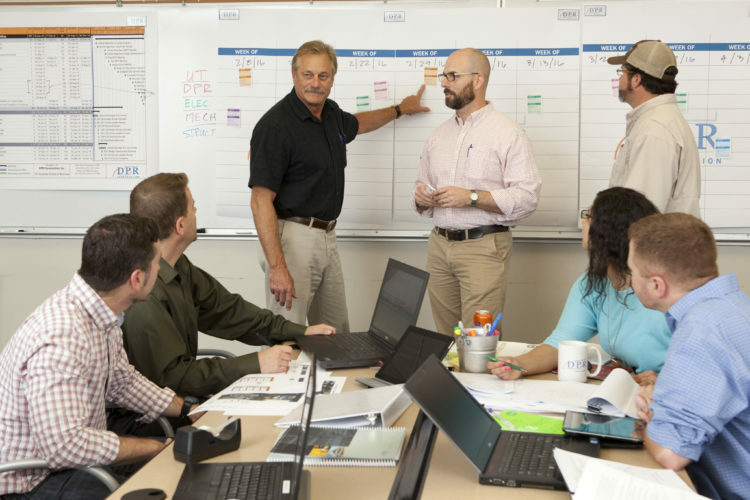 Be practical and tactical: Allow for tactical organizational issues to be considered. For example, update numbers for target value design one week and MEP another week to facilitate rapid cost feedback but not every week to give teams time for production work. Use a parking lot: Park items to stay on track and tackle later. 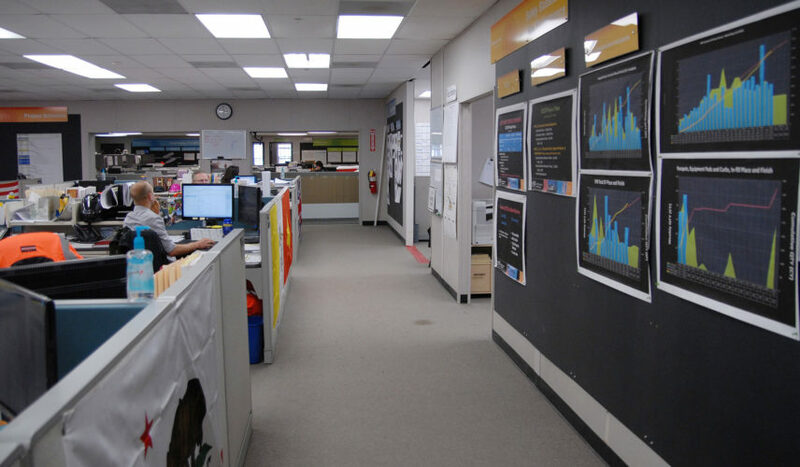 Plan the space: Provide lots of open wall space for process planning and displaying of public metrics. Have small rooms available for smaller meetings (4-6 people) and larger conference rooms for all hands meetings.